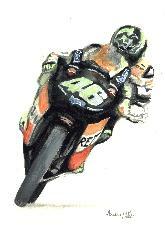 'The Doctor' is depicted being 'shadowed' by his old rival, Max Biaggi, in one of their many battles. Screen printed in yellow (the only colour, surely, for Valentino!) on a black T-shirt, this is a durable image that washes easily. Only available in Large size at present. All these paintings are available as high quality A3 prints (297mmx420mm, 11¾"x16¾"). All prints individually signed by the artist. 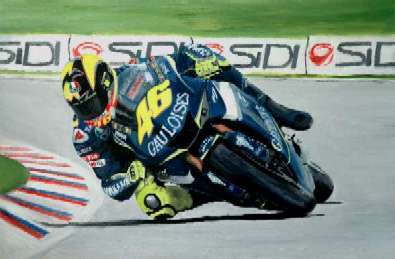 Rossi swept all before him in 2003 - his last year riding the Repsol-Honda machine before his momentous move to Yamaha in 2004. To celebrate his 2003 World Championship, I have produced this fine art quality print, which shows him in full attacking style - does he ever ride in any other way! The T-shirts are £12 each. The prints are £9.95 each. Additionally, in certain circumstances (depending on the distance involved and whether it fits in with my regular journeys), they can be supplied mounted, framed and protected by glass for £30 - free delivery. If you would like any of these items just contact me and I will send the goods to you. If you are happy with the purchase, send me a cheque for the total cost made payable, please, to Andrew Little Fine Art.